Being a native to Europe would be hard to tell by how well mint has adapted to the many different places it grows, such as, Australia, North America and Japan. In ancient times, mint was cultivated for its medicinal properties. The Japanese have been growing it for menthol for at least 2,000 years. 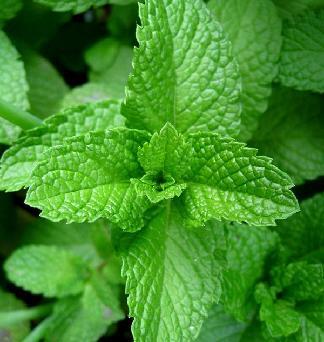 Now mint is used in many ways such as to flavor gum and candy as well as for tea and medicinal purposes. It has such a great aromatic quality that just using it to freshen up a room is a great way to use mint. Try chewing on a leaf after dinner to help freshen up your breath or to help you feel full. It is best to start mint from runners harvested from other mint plants. You can obtain runners from online nurseries, a neighbor, or a local garden center. Plant runners in early spring in pots filled with a good, slow release potting soil. Do not plant in your garden or flowerbeds, as it is very invasive and difficult to control. Mint divides and is easily propagated by digging up and transplanting. In fact, digging up and dividing every few years will be necessary. During the summer, you will need to trim back the plant to encourage new growth. 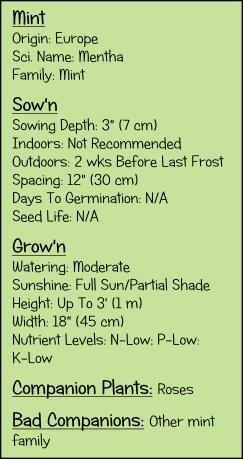 Water regularly to keep the soil moist, but not saturated. Set pots in a location so that it receives full sun to partial shade. Harvest mint leaves as needed. There are many ways to use mint. One idea is to pick a sprig of mint and run it under hot tap water to make your house smell like mint, which is very uplifting. To preserve mint, wash, dry and place in a dehydrator or oven at 110 degrees F (43 degrees C) for 4-6 hours. Store in a glass jar. Mint can also be frozen as ice cubes for easy use. Wash and chop mint, and then spoon into ice cube tray. Pour water over the tray and place in freezer. After they are frozen, put in a baggie to store. Pop in boiling water for a mint tea.